Work Smarter, Not Harder: Favorite Blogging Tools that help automate processes and save me time! When your business grows to the point you can’t do it all alone, it’s both exciting and scary. I have two great virtual assistants (VAs) that help me with blog posts and social media. But I’ve also come to rely on some things that are like having mentors, VAs, and additional employees. These tools, tricks, and services help me automate processes and save a ton of time! Since so much site traffic comes via Pinterest, anything that allows me to manage it efficiently is money well spent. 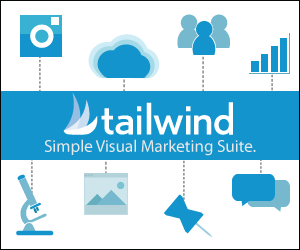 I use a service called Tailwind as they are Pinterest approved. I set up my posts to auto-pin to Pinterest “campaigns” which helps boost my site traffic tremendously. This service costs about $10 a month and is worth every penny. I schedule both maintenance pins to get views on “old” content again, as well as Pin Campaigns to give new posts a boost. This strategy has played a HUGE role in increasing my page views. I’ve more than tripled them the past year by using Pin Scheduling. Co-Schedule is an editorial calendar that integrates right into my WordPress Dashboard. I can “Drag and Drop” to quickly move a post to a new day (along with all it’s scheduled social media posts). But it’s so much more than an editorial calendar too. It’s also an awesomely effect social media management tool. The most valuable feature for me is the ability to create social media “templates.” So for new posts, I can auto-publish to them to social media as I’ve outlined in the template with just a few clicks. It saves me a ton of time. I have the option to post the social messages at a specific time or at the “best time.” It calculates the best time to post for highest engagement. Yes, please. A new feature they just added allows me to tag other Facebook pages from within the post scheduling as well. I have one of my VAs set up to use it to schedule daily posts to my FB Group too. Speaking of sponsored work. If you start doing sponsored work on your own, the Drafts for Friends plugin is beyond handy (and free!). A lot of times, when I collaborate with a brand or business, they want to review my post before it goes live. This plugin allows me to easily create a link for them to view it and set a period for which the link will work. So even though it’s not live on my site yet, they’ll be able to view it as if it is. Nifty, right? Ok, so I didn’t hire an actual person, but I did “hire” Grammarly. It. Is. AMAZING. Bottom line: It makes my work look more professional to my readers, sponsors, and anyone that potentially wants to work with me. So Grammarly is worth every penny and then some! When it comes to social media, my favorite social media by far is Instagram. It was a huge focus for me this year, and I am super picky about getting my photos “just so.” My go-to app for editing pics is A Color Story. It’s just plain awesome! I use it often on my IG feed. I rarely ever use the built-in IG filters. As my Instagram has grown, it’s become increasingly difficult to moderate and respond to comments, so I recently opted to sign up for Iconosquare to help me better manage my IG. I use both the browser application and the Iconosquare app. This service allows me to easily and efficiently stay engaged with my readers. Like most people, I detest pop-ups. But data shows them to be effective, so what’s a girl to do? I signed up for HelloBar. There’s a free version, but I have the $7 a month plan for the added benefits. It integrates easily with WordPress and allows me to create lovely corner pop-ups and sleek announcement bars at the top of bottom of my site with ease. This helps me point my readers to something special, increases page views, and (ideally) also increases time on page. See the small corner pop up on the right-hand side? Effective but not obnoxious! I was a straight-A student who got straight D’s in Accounting. It’s not my thing. While I do have a CPA to do my taxes, I opt to use Quickbooks Online for my day to day accounting. If someone as accounting challenged as I am can use it with ease, then anyone can use it! It runs me about $10 a month for the “Simple Start Plan” and takes about 10 minutes of my time to update each month. I love that it offers a desktop application in addition to being able to use it in my browser. You guys, I loved the Mailbox app by Dropbox. When they decided to shut it down, I mourned for weeks. I spent a ridiculous amount of money trying new mail management apps, and they were all a disappointment by comparison. And then I found the Boxer Pro App. Swoon. This app claims to be “a faster, smarter mobile inbox that adapts to the way you work. With tools like bulk edit, quick response and smart labels, Boxer is the fastest way to get things done. Tailor every aspect of your inbox and get more done in less time.” And it delivers. I’m on my third year as an Erin Condren Life Planner Addict. I love things to be organized and it sure doesn’t hurt if they’re as beautiful as Erin Condren’s goodies. And if I don’t write things down, they don’t happen. Everything related to my blog/business is in this cute planner. I don’t know what I’d do without it! Humor me and sing that to the tune of Olivia Newton John’s, Let’s get Physical Physical. Lettering digitally from the get-go saves me SO MUCH TIME. How do I love the Procreate app? Let me count the ways! You can read my full post on Lettering on the iPad Pro with the Apple Pencil here. And when I’m not using my iPad to be more productive by churning out lettering, I multi-task by watching This is Us while reading a magazine and working on my laptop. Like a boss. Or a hot mess. Or both. These are not mutually exclusive concepts for me. When my business first started to be more than I could handle on my own, I couldn’t figure out what to delegate in my business, so I started with something else in my life that was easier to hand over: cleaning. Last year, that was in the form of a bi-weekly house cleaner. Now that we’re living overseas, we invented in the iRoomba 960 Robot. I named him Jetson, and he does a FABULOUS job. I hate vacuuming. I love Jetson. He runs six days a week, and it’s insane the amount of dirt and dog hair he picks up each day. I give him Sundays off because I’m nice like that. Last but far from least, these are few books I’ve learned so much from as a business owner. And I say that as someone who typically only reads the classy genre known at chick lit. These books are what drove me to find ways to Work Smarter, Not Harder so I have more time just to create! What are your favorite time-saving blogging-as-a-business tools? Dawn, thanks for letting us in this weeks worth of reading. It interesting. I probably get 10% of what u said. I going to check out some of the websites u mention. You are very busy. I think it will be a very interesting year here. I wish u were right handed. The Roomba is AMAZING. I just got one for Christmas and I love it!! It’s the best! I can’t believe how much dirt it picks up each day, yikes! What are some must-have accessories for the Pro? (cases, screen protectors, keyboards, apps). I’ve tried googling, but figured the best suggestions would come from people who use them every day and love them. This is so helpful. As someone who literally just made her business official and is looking into creating a website, I can’t tell you how much information I absorbed through this! Thank you for posting this! I just started a baking blog and I’m sure this will be very helpful to me. Thanks again! I love this list! I have taken notes, and I’m off to research and decide if they’re right for me as well! I’m especially excited about CoSchedule, The Blog Village, and a maid 😉 Thank you for the advice!